I want to give a big and hearty CONGRATULATIONS to Gina, the winner of the Etymotic Research ETY-Kids ek5 Safe-Listening Earphones! Gina now has 48 hours to confirm! I also want to give a big and hearty CONGRATULATIONS to Harmony, the winner of the Hellmann's Chicken Change Up Picky Eaters Prize Pack! Harmony now has 48 hours to confirm! I also want to give a big and hearty CONGRATULATIONS to Jennifer, the first winner of the HUGE Board Game Prize Pack from FamilyandPartyGames.com! Jennifer now has 48 hours to confirm! I also want to give a big and hearty CONGRATULATIONS to Stephanie, the second winner of the HUGE Board Game Prize Pack from FamilyandPartyGames.com! Stephanie now has 48 hours to confirm! I also want to give a big and hearty CONGRATULATIONS to Ashlee, the winner of the Protect a Bub 4-Season Weather Shield! Ashlee now has 48 hours to confirm! 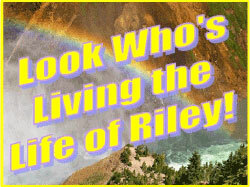 *** WINNERS *** Eva, Nancy, Gianna, Kristine and Chelsie are Living the Life of Riley! CONGRATULATIONS!